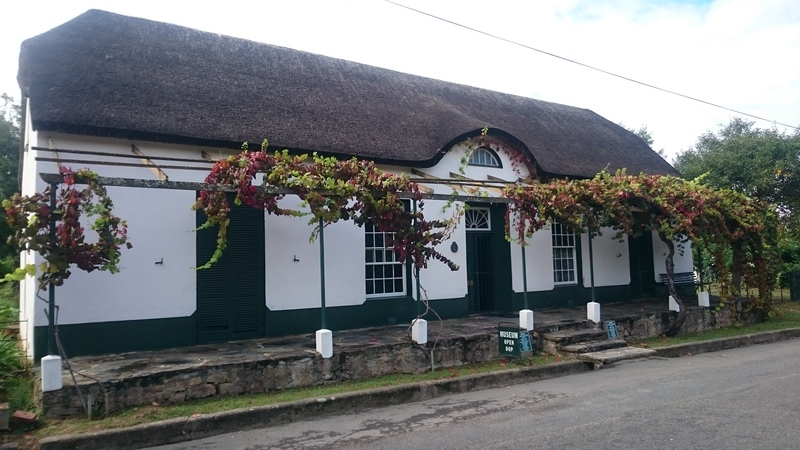 Do you know Swellendam ? It’s that quaint old town halfway to the Garden Route. It has some lovely old buildings and is set in a pretty area. I spent an afternoon there once eating huge slices of the best carrot cake ever, followed by ultra-chocolaty black forest gateau at the Old Gaol museum complex. I completed all 7 days of the incredible Swellendam hiking trail. (presently closed) in the Cape Nature Marloth Reserve that is accessed through the town. After living on rice and tuna for the duration of the hike, I had a hot shower and a slap up meal somewhere in the town. 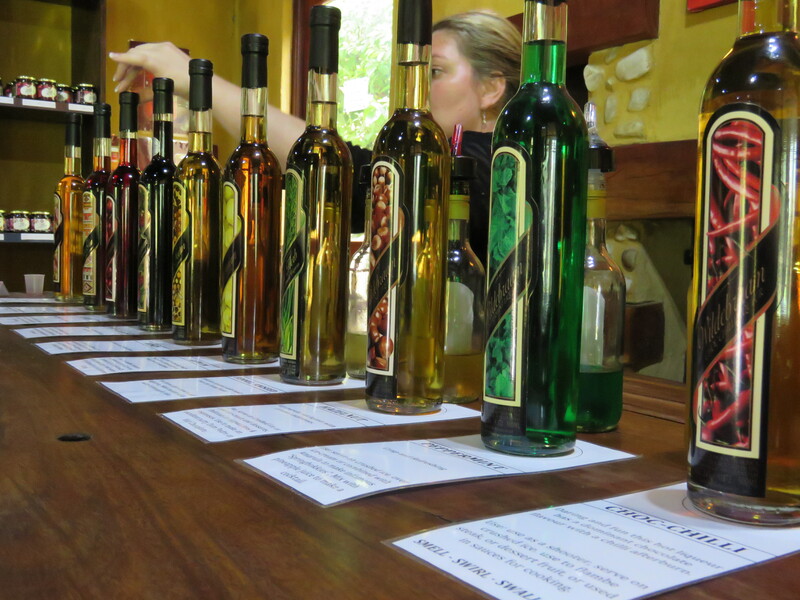 I browsed happily for three hours at a morning market on an extended stop off when driving up to the Garden Route. This fact caught me by surprise after spending just two days and one night in the area. 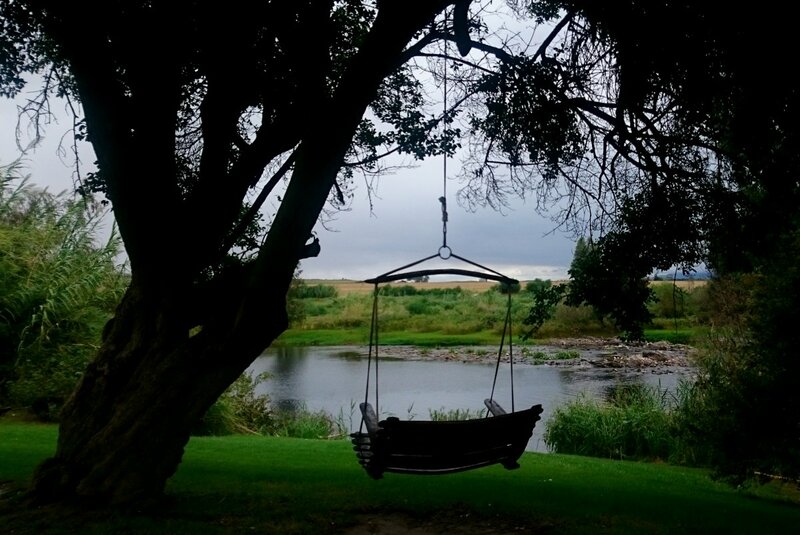 I stayed at the Stonehill River Lodge , a hidden delight situated twenty odd kilometres out of town right on the Breede River. Who even knew or associated Swellendam with a river? Family friendly, four star comfort meets nature on a farm, with a river thrown in for extra pleasure. Eight self- catering cottages configured to suit families or friends of 6 to 8 people are situated in the beautiful gardens of this lush little valley. 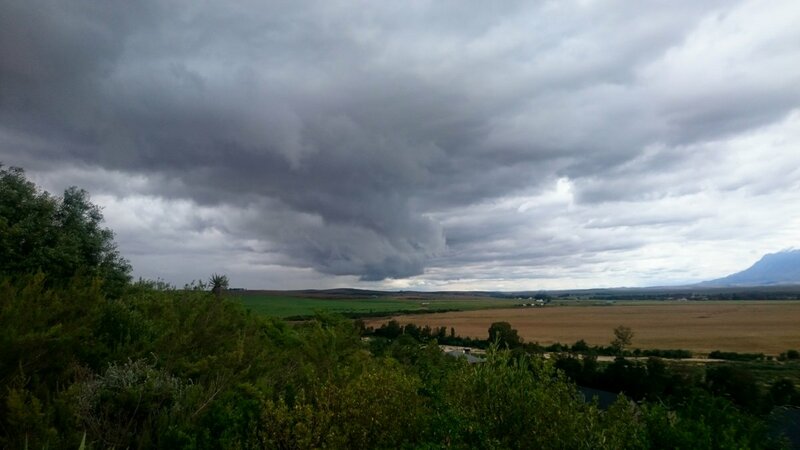 Five of the chalets are within ten meters of the river and the other three are set a little higher up affording picture perfect views back towards the town, out to the mountains hazily visible in the distance and down onto the ever turning Breede River. 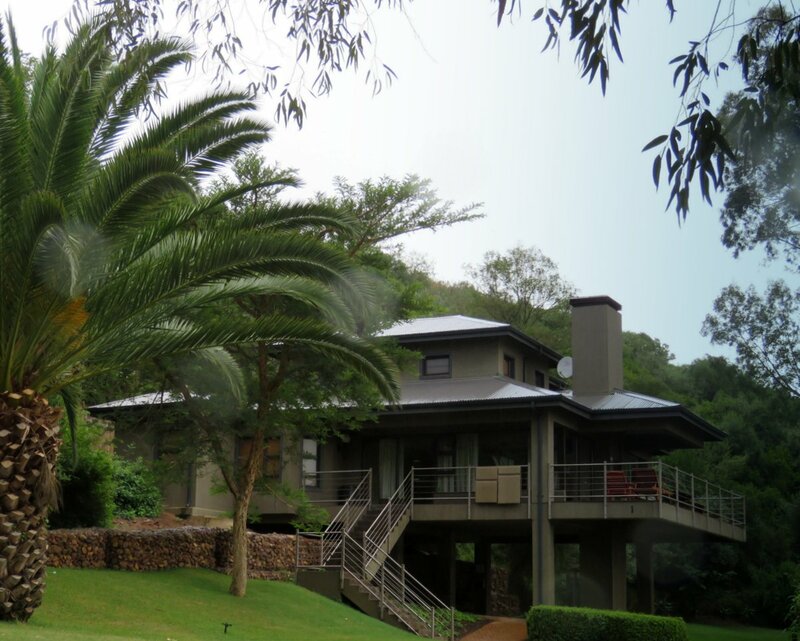 All the chalets have Wi-Fi, a well equipped kitchen with a dishwasher, although they are serviced daily, a Jacuzzi and a built in braai on the deck, as well as a fireplace in the lounge. There is no shop or restaurant on site; however the staff generally go into town either in the morning or evening and are more than happy to shop for you if provided with a shopping list and some South African Rands. All ages can be entertained for days here. 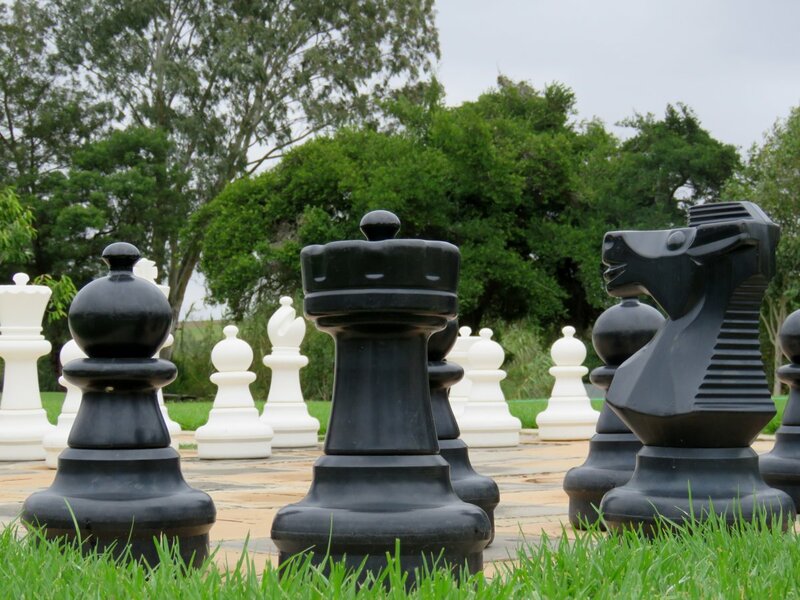 A grassy play area includes a trampoline and a jungle gym and 2 fabulous tree swing chairs where parents can relax and keep an eye on the little ones, or you can use the giant chess board to keep your mind active and get a little bit of gentle exercise. For activity addicts there are plenty of options. Bring your own fishing rods, boats or anything that floats, hiking boots, mountain bikes and binoculars. If packing all that sounds like too much effort, the following equipment can be hired on site. 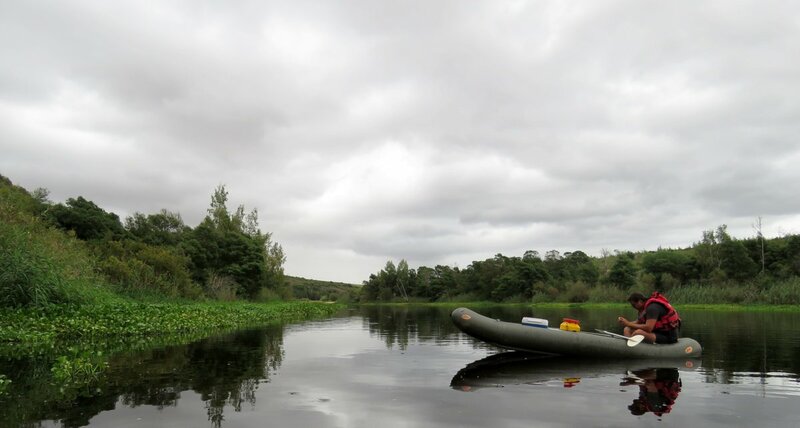 Rubber rafts called Crocs can be hired for paddling, and are charged at R125 per person. The river adventures are all guided by Niell and last for about three hours. 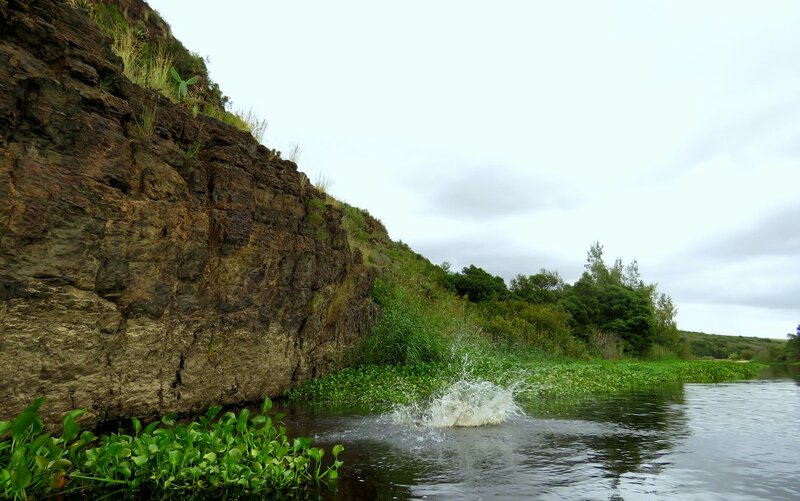 If the river is high enough there are three rapids to get the adrenalin pumping, but at any time you can jump off the rock which looks easy from the water but seems to double in height once you are standing on the top preparing to leap into space. We stopped in the gently falling rain to swim and the water was warm and velvety. Getting out was the difficult part, but the somewhat un-coordinated paddling soon warmed us up again and had us feeling ready for another dip. All along the route Niell, our guide pointed out a variety of birds, fish, plants and trees and had many stories of floods, fires and the river to share with us. Mountain bikes are an ideal way to explore, and enjoy the marked routes designed and cleared by Niell himself. Bikes are rented out at R50 for three hours or R100 for a day. I would opt for the twenty four hours as there is so much to explore on the farm. If fishing is your thing rods are R30 a day and hooks and bait can be purchased as well. 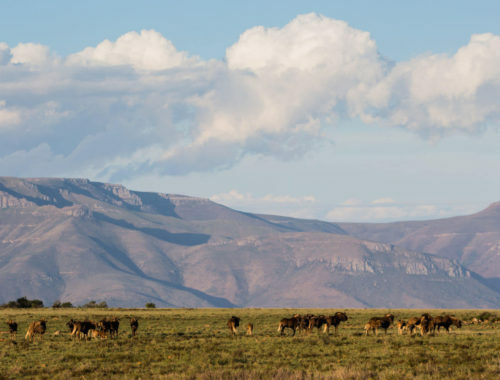 Hike for hours, pause to listen to the birds, look out for the young zebra, the delicate Bontebok, notice the fine details of the intricate fynbos and breathe in the air of a healthy earth. Cool off at the swimming pool, in the river or your own private Jacuzzi. If you want to take a picnic and make a meal out of exploring the farm, picnic baskets, cutlery and crockery are available, just ask at reception. You do need to provide the food yourself. Stonehill is an ideal place to immerse yourself in the natural world and to get kids outdoors and away from screens. Apart from all the above mentioned activities the river and bush provide endless opportunities for free range creativity. Sandy spits and shallow waters, little islands, endless pebbles and smooth stones. Build those sandcastles, splash in the river with the kids, walk in the bush and really look at your surroundings. Compete for the first sighting of the Pied Kingfisher, the Fish Eagles, Cormorants, Egyptian Geese, Swallows and Masked Weaver Birds. Boredom is not an option. Wear yourself out in nature all day, and fall asleep to the sounds of the river, the frogs and the occasional insomniac bird. If you can tear yourself away from this natural retreat, then head for Swellendam with an open mind. 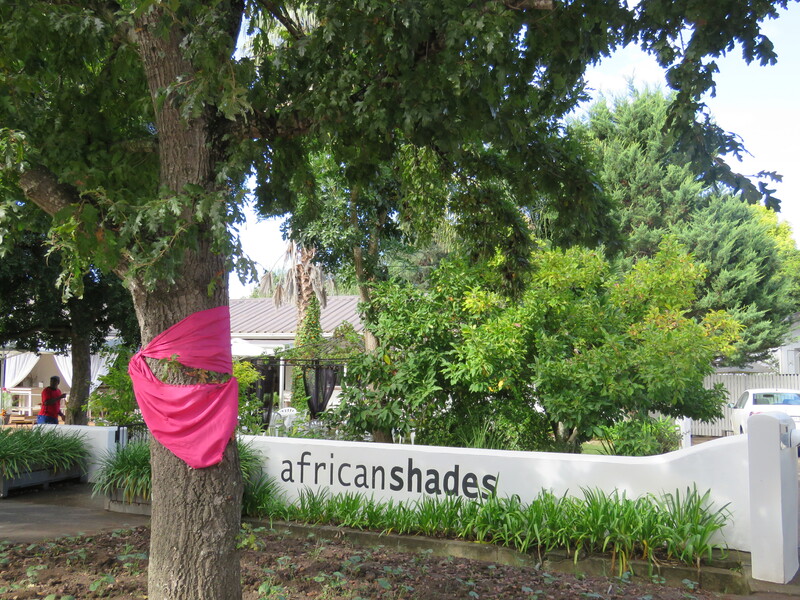 Breakfast at African Shades “First we eat, then we do everything else” is the credo these folks live by. Every meal here is a relaxed feast made with the freshest local ingredients and an abundance of love. Our hostess made a brief and smiling appearance before heading back to her creative and happy place in the kitchen. 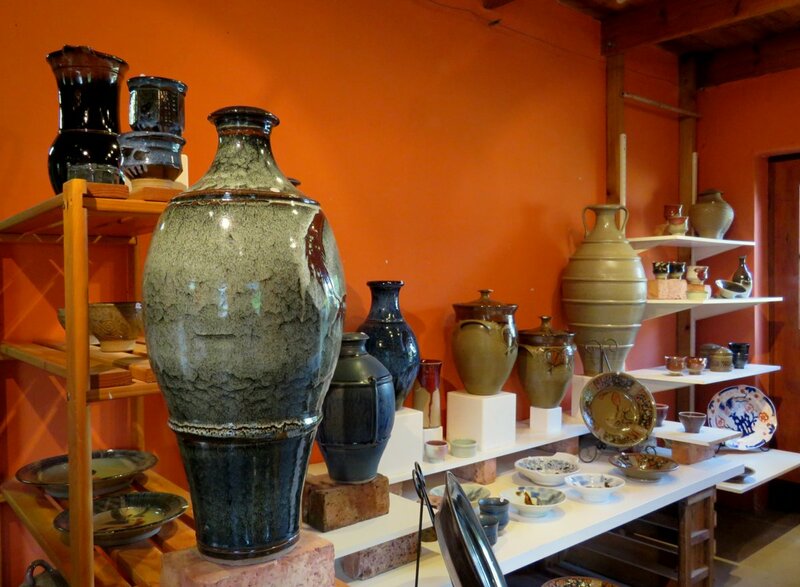 The Bukkenberg Studio is where you will find David Schlapobersky and Felicity Potter , always busy and equally ready to chat, educate and sell their works of art. 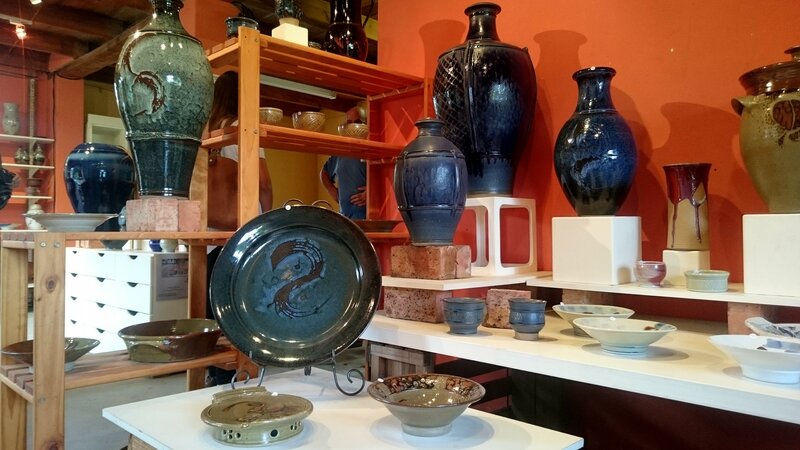 Proudly maintaining the timeless traditions of high temperature, reduction fired pottery, working in porcelain and stoneware. Lunch at Woodpecker deli and pizzeria. 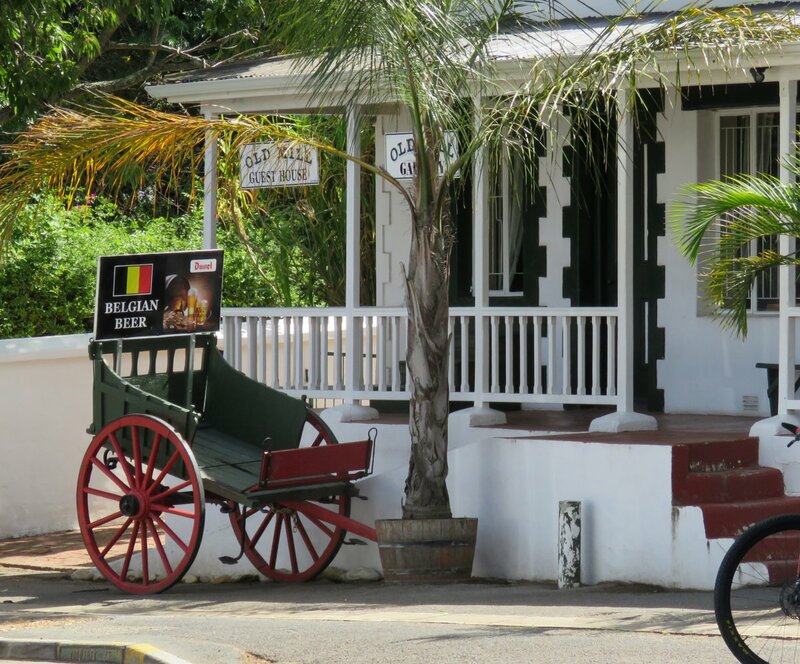 Sitting outside with a view of an old building and a horse drawn cart is a reminder that this town is steeped in history. We gorged ourselves on a selection of pizza, pasta and wraps while being entertained by the animated owner, Belinda Nesimowski who has created a comfortable, relaxing space in a building that dates back to 1835. Wildebraam . They call themselves a Berry Estate; however you should be prepared for a tasting that requires a dedicated driver to get you home. 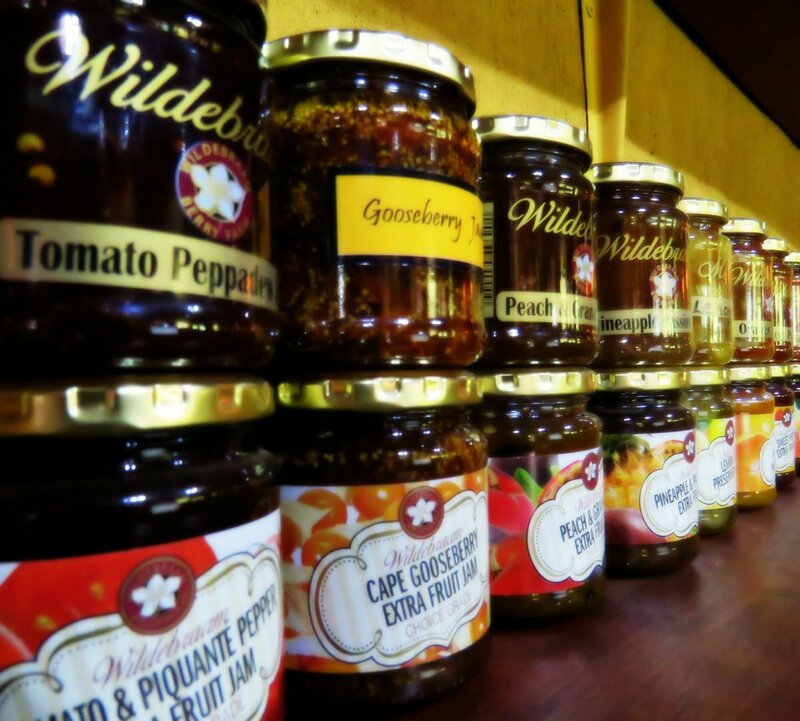 While their jams, preserves and other bottled delights are indeed the products of delicious berries grown on the estate, the things they do with the leftover juices and skins will literally blow your head off your shoulders. Averaging at around 25 % alcohol and served in innocent looking, creatively labelled bottles, these tasty liqueurs are both inspiring and potent. I gave up after the third of nine, deciding to merely sniff at the remaining six samples. I did leave with a few bottles tucked away in my bag. I’m slowly getting to know Swellendam and I like it. Stonehill River Lodge is on my list of places I will return to as they are impressive in the way they have embraced responsible and sustainable tourism. Water: they reuse grey water and even have their own mini sewage plant where after rigorous processes, clean water is returned to the river. Storage tanks and guttering are being installed to catch rain water thus lessening the amount of water they take from the river. Energy: All light bulbs used are energy savers, and outdoor lighting is set to only come on once it is dark. There are no tumble driers, and other appliances like washing machines are only used during off peak times. All geysers and heat pumps are fitted with timers. They employ a company to monitor their electricity usage and make regular adjustments to the way they function based on the data from the detailed monthly reports. Solar panels are on the cards in the foreseeable future. Conservation and the environment: All cleaning and other products used are fully biodegradable and earth friendly. A dedicated plan for the removal of alien vegetation is an on-going project. Aliens felled over the eight years of operations have fuelled the barbeques and fireplaces of all the units, and the wood store is still well stocked. The creation of the hiking and mountain bike trails has been done in a way that does not negatively impact on any fauna or flora. Regular controlled burns are carried out to stimulate and regenerate the fynbos that occurs naturally in the area. The animal population are well monitored and numbers are controlled to maintain a healthy balance. The balance is controlled by way of buying and selling stock, rather than by allowing hunting, or culling of wildlife. No interactions between animals and humans are permitted. Owl boxes have recently been installed in the trees and are just waiting for the first occupants. Owls play an important role in the control of small rodents, and it is a thrill to see and hear one in a natural environment. There is almost no refuse generated here as all organic waste is chopped up and taken to the worm farm on the property and everything else is sorted and recycled. Social: The majority of the initial staff recruitment was done in the immediate area of Railton, by way of the local church. In eight years Stonehill River Lodge has lost only two staff members. Staff are well looked after, well trained and upskilled. New staff is usually recruited from the interns provided by the STEEP programme, and Stonehill pride themselves on giving a valuable mentorship programme, ensuring that all interns leave with genuine skills and education. Staff are taken on outings twice a year and experience river rafting and other activities before enjoying a night in the chalets, and being treated as guests. How to get there, details and distances. 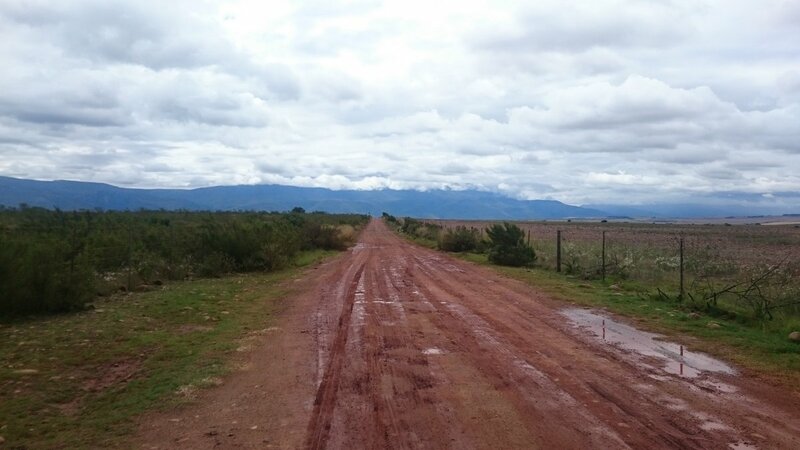 From the centre of Cape Town to the reception area of Stonehill River lodge it is 241km. 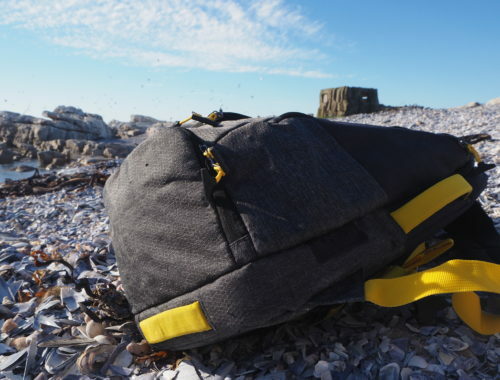 This makes it manageable for a weekend away and perfect for a long weekend or more if you are travelling from Cape Town. If you happen to have your own smallish aeroplane ( as we all do ) you can fly in to the grassed landing strip on the farm. It is 21.7km from the lodge to the centre of town. Stonehill is not wheelchair friendly. That said, any guest arriving in a wheelchair will be offered assistance in getting in and out of the chalets which are all accessed by steps. Unfortunately due to the wildlife on the farm, no pets are allowed. My stay at Stonehill River Lodge was courtesy of Big Ambitions PR. 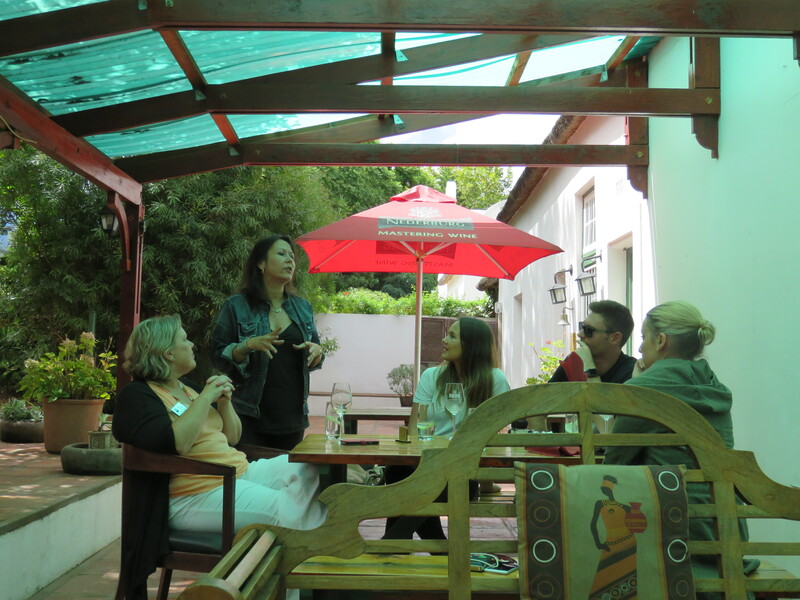 Activities and meals were kindly arranged by Alison of Swellendam Tourism. 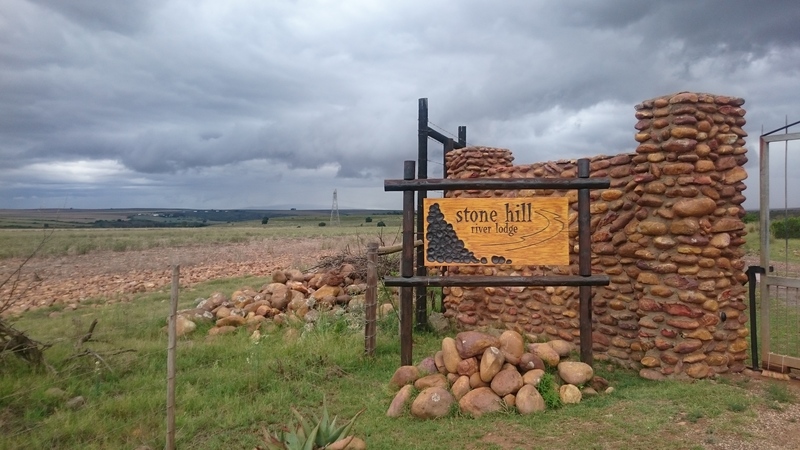 Thanks to hosts at all the venues and to Debbie Nutter, manager at Stonehill for her time and enthusiasm while answering my questions about the reserve and the responsible tourism initiatives. It looks like a Swell(endam) place to visit. It most certainly is. Stay a few days as the surrounding area is as awesome as the town. A lovely post, and thanks so much for this great exposure. Great post Di, learned more about this beautiful place. 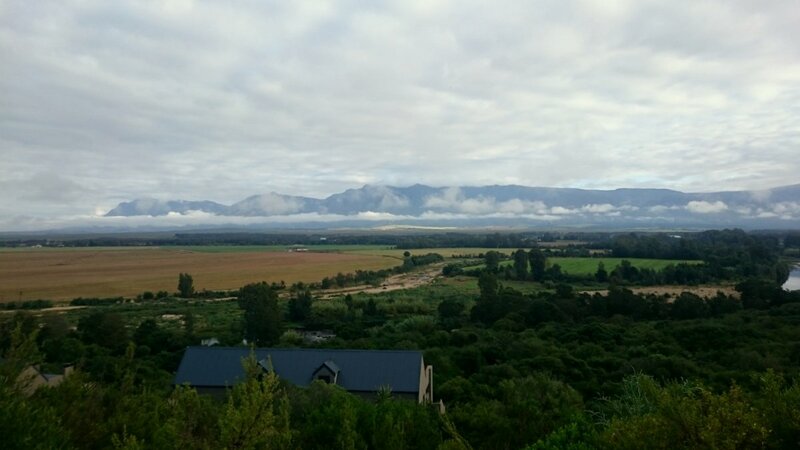 Love Swellendam – very special place to relax, hike, visit many great restaurants or just admire stuning views.